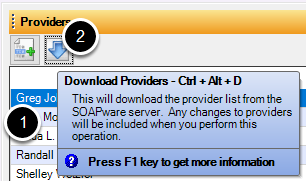 SOAPware DocumentationSOAPware FAQ'sFAQ's Support SpecificQ: I renewed my support agreement but still get a pop up asking me to renew. A: If after renewing your support agreement, a provider's license might need to be refreshed. Click to highlight the desired provider. Click on the blue download arrow. Log out and back into SOAPware for changes to take effect. Previous Lesson: Q: How do I enter "Electronically Signed By" into my SOAP Note? Next Lesson: Q: How do you add another Vital Sign to the Vital Signs chart section?